Exiting Oklahoma City this morning we very quickly left the Expressway and crossed the restored Lake Overholser Bridge and drove along the lakeside. Back on the four lane R66 and out of the city the landscape is getting more prairie-like. R66 runs back and forth on north and south frontage roads alongside I44 and into the small towns along the way. We crossed the South Canadian River on a long bridge which has a beach underneath and judging by the graffiti and litter, is well-used. Elk City has the National Route 66 museum which is pretty good. The small sample of various types of barbed wire therein is enough – you only need to visit the Devil’s Rope Museum in McLean devoted to this topic if you have Aspergers. We soon crossed into the Texas panhandle and are now very clearly in cowboy land. Groom has a huge cross billed as the largest cross in the Western Hemisphere towering over it. On the outskirts of Amarillo I saw some of the longest goods trains I have ever seen. 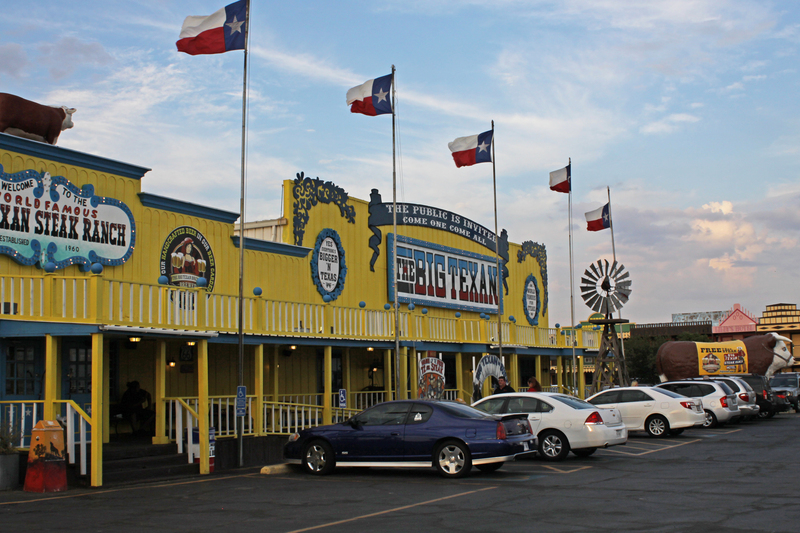 We had a great evening catching up with Seah Lim, meeting Mandy and two of their children and enjoying their hospitality at the Big Texan and their home. Hope we can reciprocate soon.